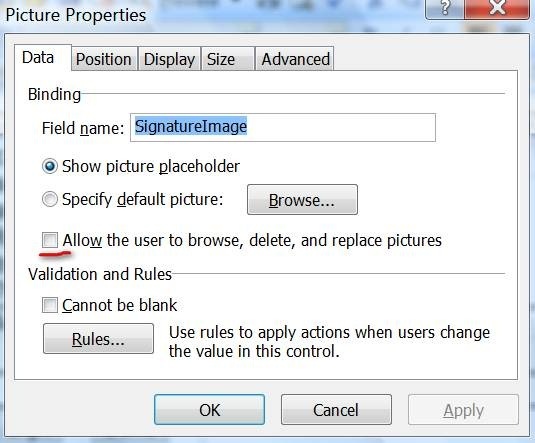 Using Topaz Signature Pads to Capture Signatures for InfoPath 2007 Forms | Are you a user? This is a great solution created by Richard Wixom, whom I’ve worked with over the years. Richard is the president and owner of DNSalePrice.com. He spends a lot of his time buried in algorithms deciphering the goings on in the domain name industry and creating huge databases with information about domain names. We collaboratively worked on this solution and thought it was an interesting exercise that others might appreciate. 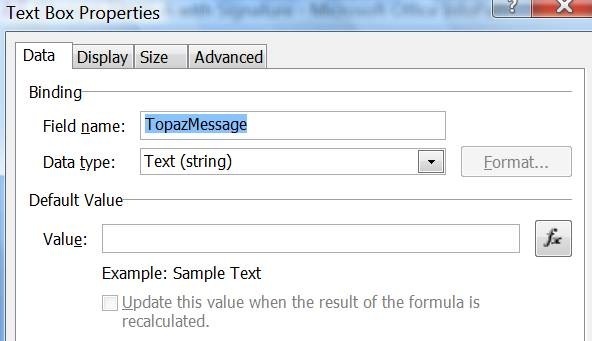 TOPAZ Signature Pads can be enabled for InfoPath 2007 with the signature image then stored and embedded within the InfoPath form. The following approach uses C#/.Net managed code with the code and appropriate DLL’s embedded within published InfoPath forms. Standard InfoPath features such as email distribution, SharePoint storage, etc. are available for InfoPath client. Web-enabled InfoPath forms are not supported. 1. TOPAZ signature pad hardware and software installed. 2. Security level for InfoPath form set to Full Trust and signed. 4. 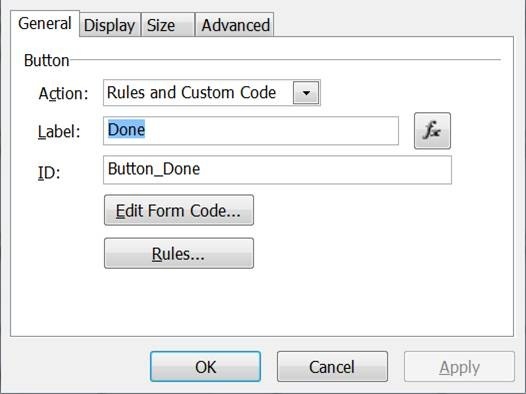 Compatibility for InfoPath form and “Design form template that can be opened in browser” is not set. 5. Local access to the C# SigPlusNET assembly. This can be found in the Topaz’s “SigPlusNETDemoCSharp” download that is available here. Estimated time to complete should be under five minutes. Set the control properties on the first button (Label and ID) as shown below. Both C# and XML are case-sensitive languages so be sure to use the same letter case as shown. 1. Under the .Net tab, locate and add “System.Drawing”. 2. 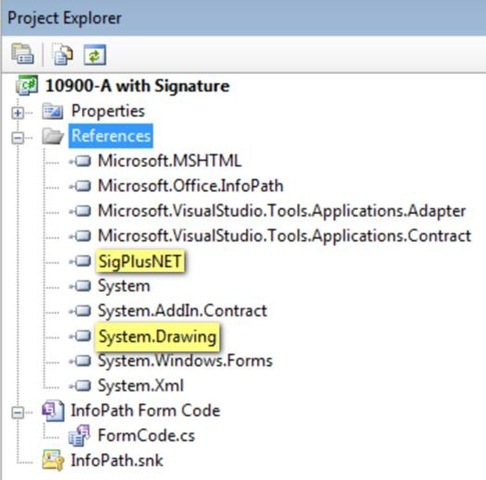 Under the Browse tab, navigate the full path to SigPlusNETDemoCSharp (see Prerequisites) and add “SigPlus.dll”. Now cut and paste the following replacement code over the default code — EXCEPT you will need to preserve the default namespace that is provided. The following is an example of the default namespace that you’ll need to preserve when pasting the replacement code. // NOTE: The following procedure is required by Microsoft Office InfoPath. // It can be modified using Microsoft Office InfoPath. Click on “Build” and verify that your template builds without programming errors. If you encounter any errors, correct as required. The most common error will be incorrect entry of control ids as noted above. Save your source files, close Visual Studio for Applications, add required content and controls to your InfoPath form and publish. I have done everything as stated on the blog, I am getting this error. The link is a screen shot. I am awful when it comes to the C# stuff. Thanks for your help. An unhandled exception has occurred in the form’s code. Any ideas on what I am doing wrong? any help would be greatly appreciated. Of course, one of the things that happens when you post code that is not fully debugged is that you get, well, uh…bugs. Try something like this in SetSignatureImage. I was also receiving the same error message as Julie Ziriax and replaced SetSignatureImage with what you provided, but it is still giving me errors while building. After trying on my own for a while, the best I could do was still having DeleteNil create the same error message as before. The code below works beautifully for us. // this is where the real work is done. Simply take the bytes from the signature image and convert them to base64. The xpath is incorrect. In order to get the correct XPath, just get it from Infopath by right clicking on the My Fields on the right and selecting Copy XPath. For a strange situation i have to replace using to Imports and the rest of the code doesn’t work i have 66 Errors, can anyone help me? that is a good solution, I was wondering if there is a way to also have the signature be displayed on screen as it is being drawn, maybe with ink picture? That would be helpful for people that don’t have a signature pad with LCD. Is there a way to have the signature show on screen while drawing? This would be helpful if someone doesn’t have lcd on signature pad. Topaz Signature Pads are very helpful for my business because I have to sign thousands of documents and checks daily. It has made my work a lot simpler. Not aware of one. Sorry. The server was unable to save the form at this time. Please try again.